Ricky Romero's father, Ricardo, was border-smuggled to the states in 1979. He's now a truck driver in Los Angeles, and Ricky's mom, Sandra, drives a school bus. These are some of the details in a fabulous new SportsNet video examining Ricky's ascent to stardom. Love it. So happy for that kid. I call him a "kid" because I'll always remember Romero as a big-name prospect, struggling to navigate through Double-A -- for three seasons. One day he taped a Sports Illustrated article inside his locker for motivation. The SI story was on Troy Tulowitzski, coming off an '07 Rookie of the Year campaign, and the article hammered Romero, who'd been selected ahead of Tulo in the '05 draft. "Right now, we made the wrong choice," then-GM J.P. Ricciardi was quoted in the magazine. Ricky Romero is representing East LA in a big way. Romero made 10 starts before earning his first Double-A win, and he posted a 10-17 record (4.97 ERA) in three seasons at New Hampshire. In August 2007, the Fisher Cats were making a push to the playoffs and needed a clutch start from Romero. He was lit up by the Sea Dogs, yielding eight runs in 2-2/3 innings. "This is where I spent a lot of time maturing and growing up. This is where I learned the highs and lows," the Blue Jays ace later told me on a return trip to Manchester, N.H. "I kept telling myself that when I finally get there (to the majors), Toronto is going to know they made the right choice." When I asked Adeiny Hechavarria about growing up in Cuba, he said they played baseball in streets and most kids didn't have gloves. What about bats? Hech made a chopping motion with his right hand, describing how he and his friends would use a machete, hacking away at tree limbs with the proper thickness. These were the most memorable interviews of a championship season. Many times after Fisher Cats games -- after the newspaper deadline was met -- I'd return to the clubhouse and speak with assistant coach Danny Solano about Adeiny, who often stopped by to join us. It was fascinating. Here was a player turning double plays with John Tolisano, whose father had a batting cage installed in the backyard. Adeiny and his brother, Alien, grew up poor in Santiago De Cuba, crafting wooden bats from tree limbs. He went on to play for Cuba’s junior national team, defecting at a Pan-Am tournament in Mexico. “A lot of things went on that I can’t talk about. It’s difficult,” said Hechavarria, who signed for $10 million and found a way to move his father to Florida. When we last talked in August, he was trying to bring his mother and brother to the U.S. I wondered how much of his $10 million contract (through the 2013 season) has been spent on back-channel deals and agent payments. Blue-collared Fisher Cats skipper Sal Fasano, a son of Italian immigrants, provided some money quotes when asked about Adeiny's background. "That's the beauty of this game. Once you fall in love, your background doesn't matter, even if you played catch with rocks as a kid." In July, Adeiny made a game-saving play by ranging into the hole at short, back-handing a grounder, and firing home to throw out Reading's Stephen Susdorf in the ninth inning. "If he made that play in the majors, we'd be seeing it on SportsCenter and talking about it for a week," Fisher Cats pitching coach Pete Walker said. 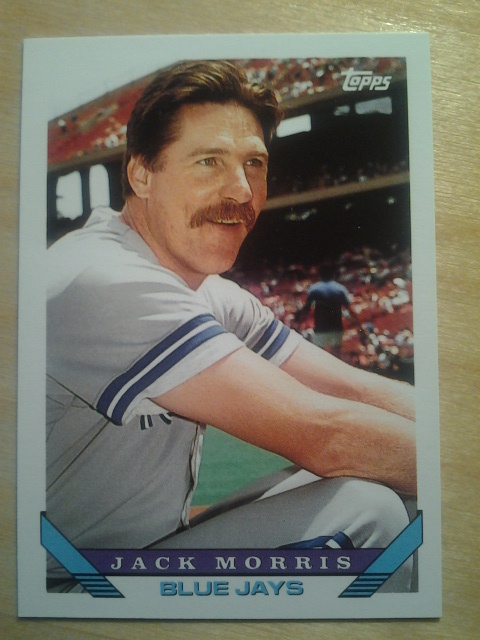 Something about this pose and 'stache that is so cheesy yet effective. Best caption wins the card, plus a bunch more cards from that era. Will he get the call from the Hall?